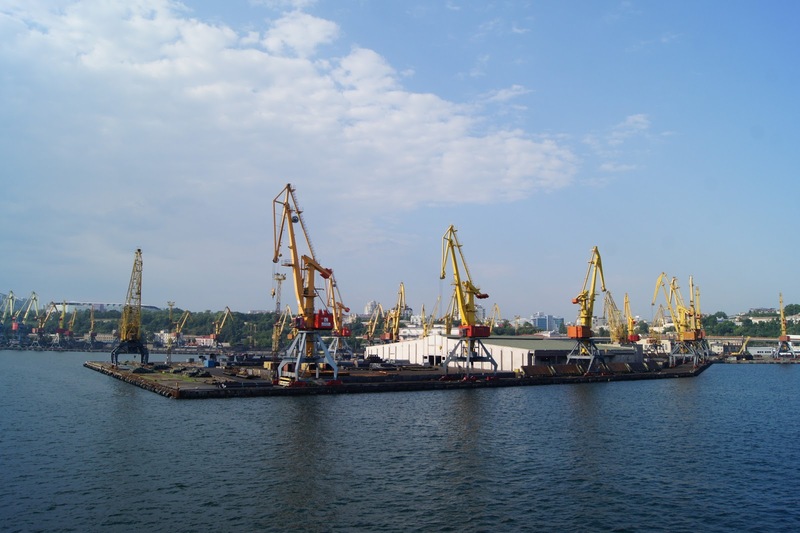 The first thing you'll notice about Odessa if you reach the city from the port is that it's industrial; the second thing you'll notice is the Potemkin Stairs. 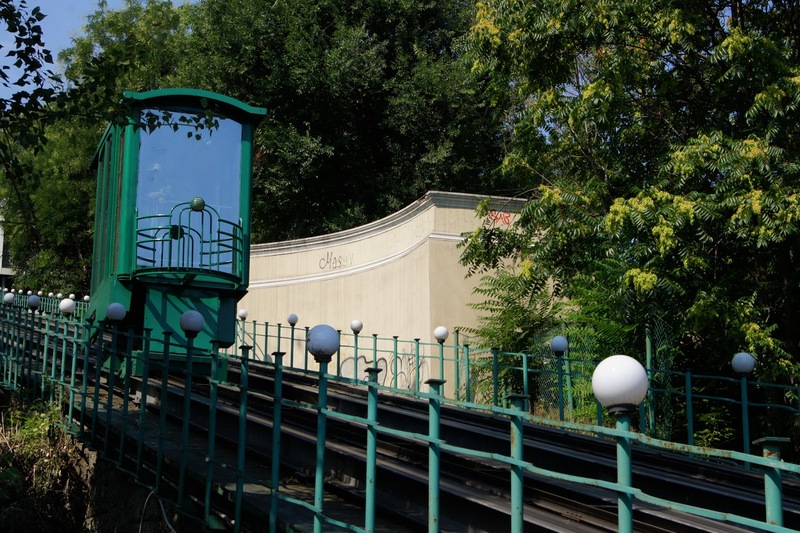 The third thing you'll notice if you choose to take the funicular instead of walking up the 192 steps--lazy--is that they don't take euros and they are not very nice about it--which I guess is the fourth thing. But Oscar the Owl Impersonator does not usually take нет for an answer. 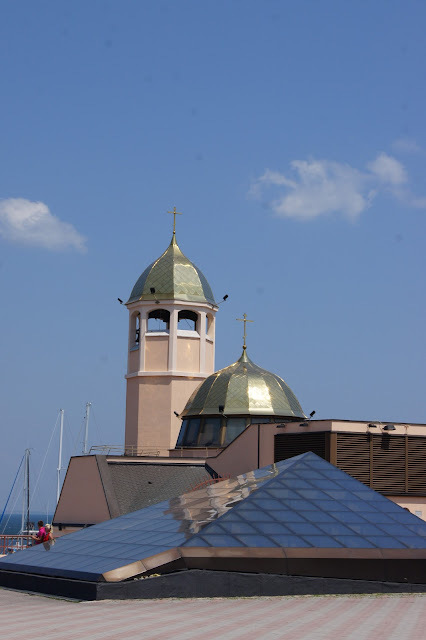 "We're not leaving," he tells the funicular attendant. "Who, who." The attendant gibbers on in Russian, but each time she comes up for air, Oscar the Owl Impersonator says, "We're not leaving" and holds out the euros. "Who, who." Actually, I don't end up riding the funicular. Oscar and his mom in the wheelchair do, but I take the 192 steps. And I do it two at a time, which means it was more like 466 steps, right? Long climb short, I'm treated like a hero at the top by all the lazy funicular riders. "How many steps were there?" one man asks. "I have no idea," I reply. He looks at me as if I'm a fool for not counting. "There are supposed to be 192." "Well," I say, "I took them two at a time, sometimes three, and I'm not out of breath as you can clearly see." "You're my hero," he says. "Because you can rhyme." 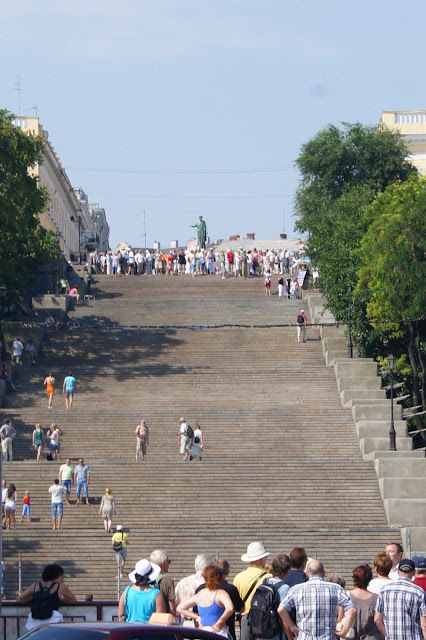 Did you know that the Potemkin Stairs were originally called the Boulevard Steps, the Giant Staircase or the Richelieu Steps but are officially called the Primorsky Stairs? And how snoring is this information? Goodness. Very. But did you know that the stairs were constructed so that only the landings are visible from the top and the steps themselves only from the bottom? And that there were originally 200 steps? But that eight steps were lost when the harbor was renovated? Not snoring anymore, are you? Now there's a huge awful road between the harbor and the steps. Moving on up to the city of Odessa . . .
We decided simply to have a walk around the old town and eavesdrop on the guided tours we stumbled upon. This, by the way, is a great way to save money. The trick is to get close enough to hear the guide without actually looking as if you belong to the group. I've found that if you sit on a bench right behind the guide and pretend to be talking on a cellphone, you'll go completely unnoticed. If no bench is available, just stand directly behind the guide, back to back. Though on the surface it might seem so, Odessa is not really made for wheelchairs. The streets are in dire need of repair, and then there are cobblestones. If you have a reduced-mobility person in your group, make sure to have their vertebrae checked before the trip. You wouldn't want them to have a slipped disc just because Odessa can't be bothered to have even sidewalks. No idea what connection Proust has to Odessa. Maybe someone just likes him? 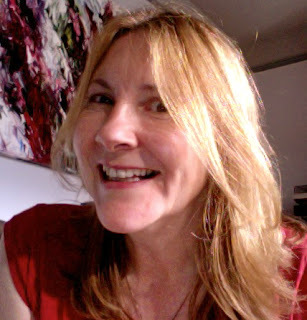 Next time, I'm going to take you to the island of Samos in Greece and the best tomatoes I've had in a long long time. To continue with I Must Be Off! A-Z, go to P is for Porto. 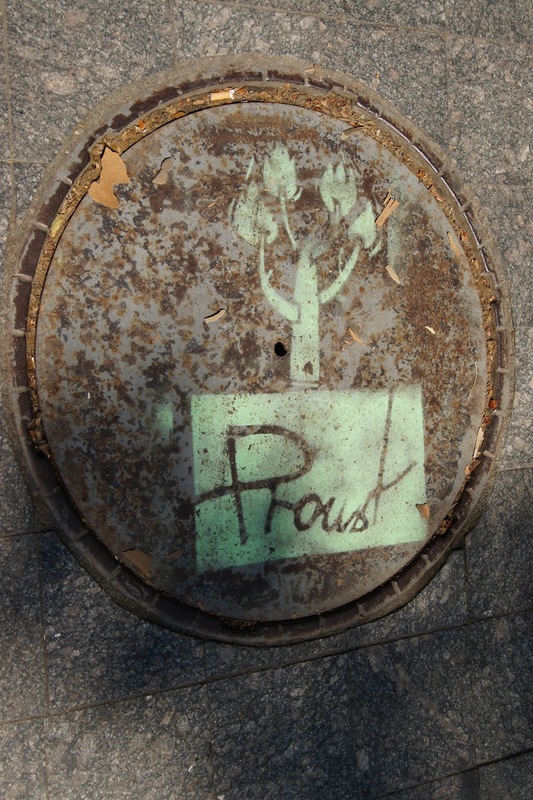 What *does* Proust have to do with Odessa? Good mystery with which to end this post. I, too, would have taken the 192 stairs. I can't resist stairs. Stairs are great for your behind. We stairs people have great ones. 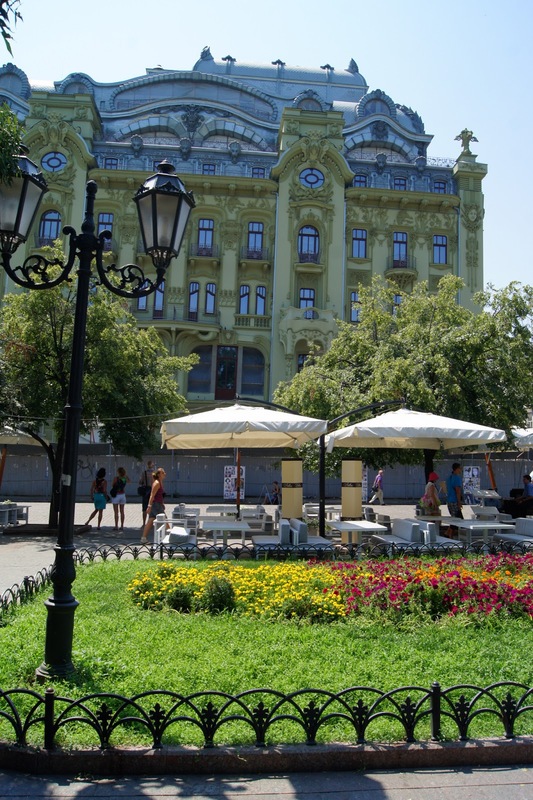 Thanks for your great story about Odessa, I was there last year, and I should admit this is very beautiful city. 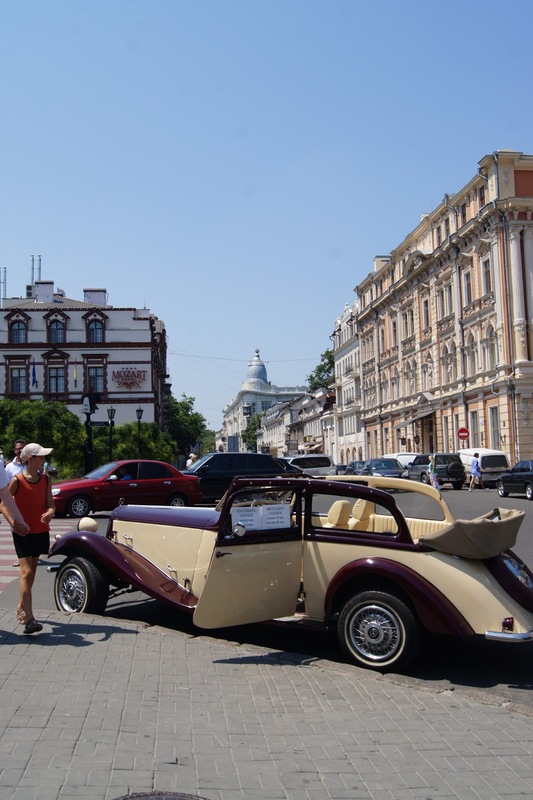 Besides, if you want to visit some other Ukrainian city I can recommend you one great website http://touristclub.kiev.ua/ you can check and book a hotel or look for some interesting places to go, sure it will be useful for you. Good luck.